Amanita Muscaria, a symbol of good luck! Knowing Calamity Kim: actual good luck! She may be the busiest, most creative elf I know, and generous. Really, amazingly generous. Also, inspiring. Really, amazingly inspiring. Last month she sent me a message... let's exchange ornaments, she suggested. I'll send you a chicken, if you send me a red capped mushroom. And I jumped at the chance, delighting in the prospect of receiving one of her sweet creations. So. First: I Googled "red cap mushroom." I was pretty sure she was talking about those adorable little Christmas mushrooms, the ones that attract fairies and gnomes. And it was not hard to imagine such an ornament, in her collection, a fanciful foot stool for elves, a shelter for woodland mice. But, my second task was to devise a way of creating this red cap mushroom... making it worthy of the Queen of Craft! I was delighted to realize that the materials were close at hand. At the time I was up to my elbows in warm suds and wool, felting bars of soap. 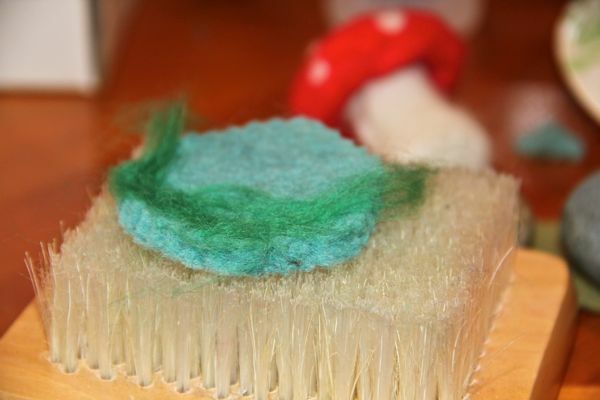 Maria and I made some last spring, and I liked the idea of wool felted soaps for Christmas gifts. Up to this point my wool experience was limited to those bars of soap, some needle felting, and lots and lots of colorful wool balls. I was not too sure how all of this would come together for a three-dimensional, multi-colored, discernible form. Outside I found a stone. A good size stone for a mushroom cap, and in the same fashion that made felted wool bars of soap, I felted the stone, but before the stone was completely encased in wool, I slipped the stone out and had a little red pouch. I needled felted white dots, then set to work on the mushroom stem. That was very similar to making wool bracelets... just a lot thicker and shorter. A funny thing about the wet, soapy wool: you have to employ a little faith and patience... I was close to the form I wanted, but it looked and felt like a soggy, limp mess! I had to let the stem dry, and as it dried I would tweak the shape, sometimes squeezing it gently, sometimes needle felting small loose bits. 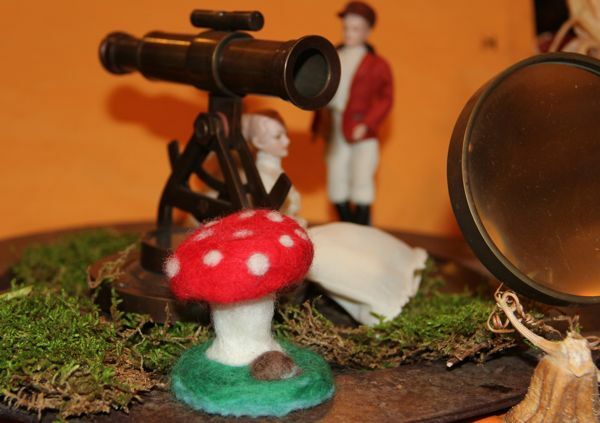 Once the cap and the stem were complete, I slowly, delicately, needle felted the stem into the underside of the white spotted, red mushroom cap. Little jabs, round and round, and easily they bonded together. The next concern was what I could do to add to the piece, to make it an ornament. That was when I decided to make it an ornament that could perch in a tree, or sit in a woodland scene, so it would need a base. I found a small wood round, and glued a piece of blue wool felt to it, then needle felted a forest floor... a green mossy mound, and a small river stone. 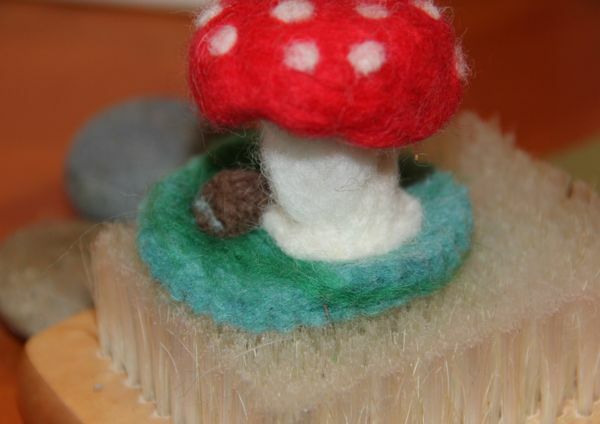 Next came the red capped mushroom and I carefully jabbed at the base of the mushroom stem, felting the wools together. What fun! Happy muses, was I ever delighted with how each step of this new adventure came together. Playing with wool is wonderful, satisfying, stress-free. It's nice enough, for my own amusement, to find something enjoyable, to make a success of an idea, but when doing something for someone special, someone I admire... well, I was so relieved and amused to discover that it really did work! There's more to share, soon, and maybe you remember a cute chick swinging in our Christmas tree? Thank you, Kim! It's a darling little mushroom - way to go! I'm curious to try felting while the felt is wet, I've always just used dry wool roving. Also, does your needle get dulled at all when you felt on a hard object like the rock? Just curious. I admit: I did have the rock in the red cap for a bit, so I could needle felt those white dots, but it was stressful... I had to poke very shallowly, slowly, because I knew I would break the needle tip. So, then I salvaged around for a chunk of dense foam and used that to keep the form of the cap, while I poked in the dots. 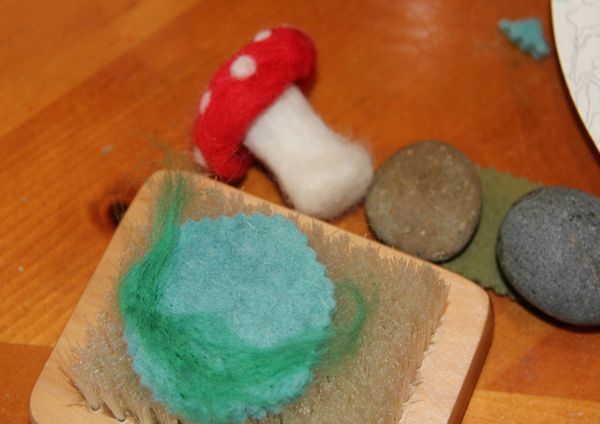 So, you haven't tried wet felting? The balls, bracelets, and soaps are fun to do. 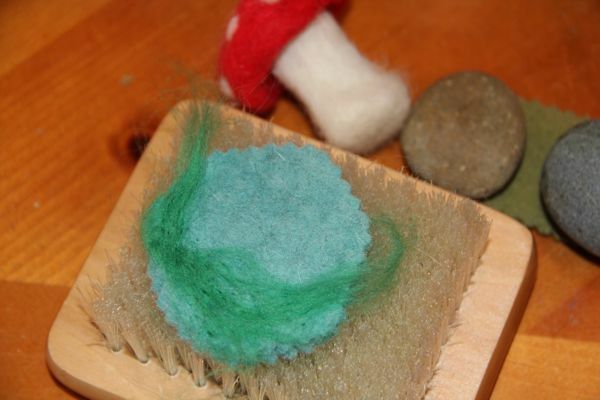 One tip I should add to our post about felting soap: get a small plastic mesh bag. Our garlic comes in one of those little bags, and once I have the bar of soap wrapped in the dry wool, I slip the small plastic mesh bag over it, and hold it, securely, under the faucet. The bag keeps the loose wool together, while the texture of the bag aids in the felting... it's made a huge difference! That is totally adorable! I've only tried felting once, to make acorns necklaces with little hearts on them...it's quite a labor of love so I fully appreciate your mushroom creation! On a side note....have you & Maria read the book "My Life As A Chicken" by Ellen A. Kelley? It's a really fun book and I've been meaning to tell you about it before I return it to the library. I think you guys would like it! It's just a kids book, but it's cute & worth a read. Felting came onto my radar about a year ago and I didn't think much of it, but recently I've seen so many cute projects that have me very interested. Your mushroom is adorable! Thanks for sharing with us.